We want all pets to be safe while they travel with you. It’s not always easy to know what is poisonous in places you aren’t familiar with. So we’d like to give you a free pet safety guide on plants toxic to your pets. You will also receive a copy of our monthly newsletter. 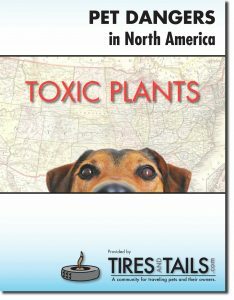 Get your free copy of Pet Dangers – Toxic Plants emailed to you simply by filling out the form below. The T&T newsletter is emailed monthly, and you may unsubscribe at any time. All email addresses are kept strictly confidential and never shared with any other party.